Do you use and love Booksrun? Our affiliate program is open to our customers and friends! We pay you for the referred sales. As simple as that! Does it cost anything to become a Booksrun affiliate? Becoming a Booksrun affiliate is completely free of charge. No, you don’t have to achieve a certain amount of sales to become a Booksrun affiliate. Simply click the button on the right side to join an affiliate program. Choose an appropriate option (referral link, social share, book search widget or price retrieval API) and start earning! How do I track affiliate sales? We provide you with 24/7 real-time reporting. You will be able to see all the orders and commissions that you have referred to our site. 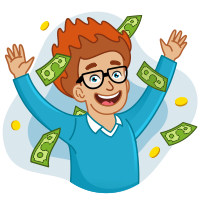 Apply right now and instantly start generating affiliate income!